When I said chilled out, I meant literally a chill, no-fuss walk through adding UITests for your Xamarin.Forms project solution. There’s many articles and tutorials out there regarding this, but when I first started I couldn’t find a clear enough guide to begin with for myself, so I was stumbling around in confusion here and there until I self-learned a proper foundation. That’s why I thought of writing this post. This is an attempt of sharing my experience and intuition of how to architect a better UITest structure for your Xamarin.Forms Solution helping you to get a clear and easy head start! So I’m not gonna get into extreme baby steps, or details, but a clear fuss-free hands-on guide for starting off with your UITests, which I hope would give you a clear picture and understand of the whole shabang! After all I’m all about that solid project architecture! Hey, if you’re looking for a serious intro, please Google! I don’t like repetition of content lol. Just for the showcase of this awesomeness, I created a little App, which is called Textpad, where you simple take notes or texts of whatever you feel like. 😉 A very simple out of the box Xamarin.Forms app, and fully MVVM architectured code base with Prism. I named the solution as “XFWithUITest” just for this demo. Whatever the default template of the Xamarin.UITest has provided, I have done several changes to it here and there for the clarity and of the code base as you will see in this article. So I’m gonna walk you through a clean and well-structured manner of adding Xamarin.UITests to your project solution. There’s many ways to structure a UITest, but I like a clean separation of the elements in any solution architecture. Like here we’re going to separate our Tests from the actual Host projects. 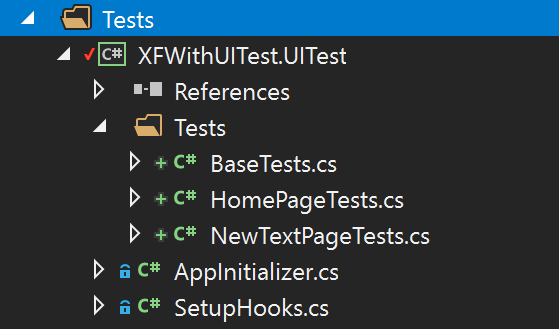 So first, for the name of separation let’s add a Folder called “Tests” in your Xamarin.Forms solution. Yes, that’s the way to start! 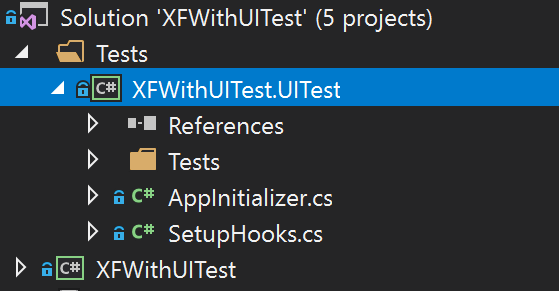 Then let’s create our Xamarin.UITest project, right-click on the “Tests” folder in the VS Solution Explorer and go to Test tab and select Xamarin.UITest Cross-Platform Test Project! Also pay extra attention to the Name and Location value for our UITest project. Append “.UITest” at the end of your project name. As of the location, make sure to add the path along with the “Tests” folder that we created above. Now it should look something like this! Make sure all the necessary nuget packages are in place, which is just basically the following 3 nugets! yep that’s it! This class comes pre-populated when you first create the UITest project, but I have made some changes of my own for the clarity of the code. As you can see I’m passing in an extra boolean parameter “clearData”, which is to execute a clean instance of my App for testing. Now instead of getting a hook on the InstalledApp(), you could use the path to the APK or IPA file using the ApkPath() or AppBundle() respective for Android and iOS, which is totally up to your choice. Then I’m passing in the AppDataMode parameter according to my choosing of the “clearData” value. Remember earlier I created a class called SetupHooks? let’s set it up now! During UITests execution we’re holding a singular instance of the app in memory, which we’re calling through UITest’s functions to perform many operations, so to simplify that, here we’re holding a public static instance of the IApp and Platform object to be used in our Test cases. 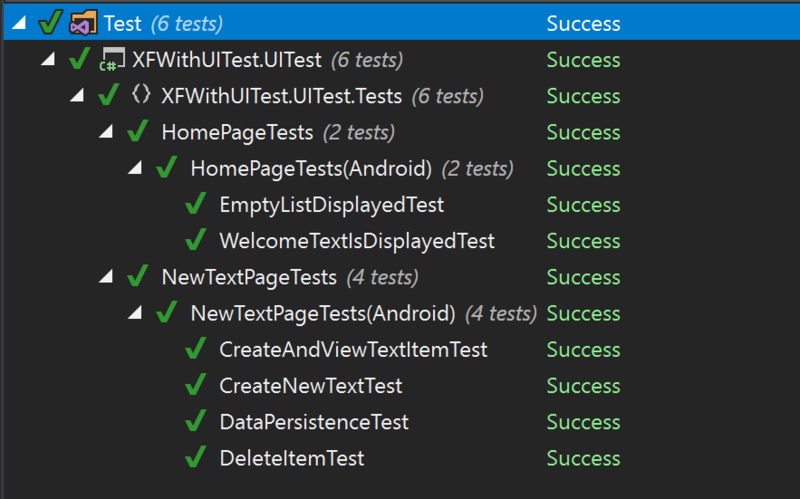 Create a class called AppTests, which is where we’re going to place the Test fire up code and the rest of the tests for now! [SetUp] is where your Tests will initialize the actual App instance, thus retrieving a hook to the app’s instance for our Test cases to use. You can see how I’m tying up the SetupHooks – Platform and App instances, through the initiation of the AppTests. Now you’re all set to start writing your UITests, but before we begin I need you to check up on something else! Whatever the UI element you need to get a hook on to or get a reference of, be it a Page, Button, Layout even a Label, you need to add a value to its AutomationId. The Xamarin.UITest.IApp interface provides a whole bunch of functionalities for the app for us to play around with in order to execute our test scenarios. Take a look here, Xamarin.UITest.IApp to see the list of powerful functions we can use. To name a few are Tap, Swipe, Scroll, WaitForElement and etc, to be performed on any given UI Element on the screen. So now all you need to do is get a hook on any given element..
Or you could do by even the Class name of the element. Choice is completely yours, pick the one best suited for your test case. How to write a Test? Now this is the coolest part, Xamarin.UITest allows us to get hooks on to UI Elements of the running App, then we perform actions on those elements and wait for the results and check if it resulted as expected through assertion using NUnit. As a standard keep in mind to append “Test” at the end of each of your Test cases. As you can see above I’m first waiting for the HomePage to appear, then I’m asserting it through NUnit. Then I look for the Label with “Hey there, Welcome!” text! Here’s some advanced bits that could come in handy! And you’ll be presented with a CLI which will help you see the whole UI tree of the screen. Simply type “tree” in the CLI and you’re good! Now there’s many ways to structure all the test cases and scenarios, and there’s no strict standard way that should be followed, but whatever you’re comfortable or fits your project is totally fine and the choice is yours! 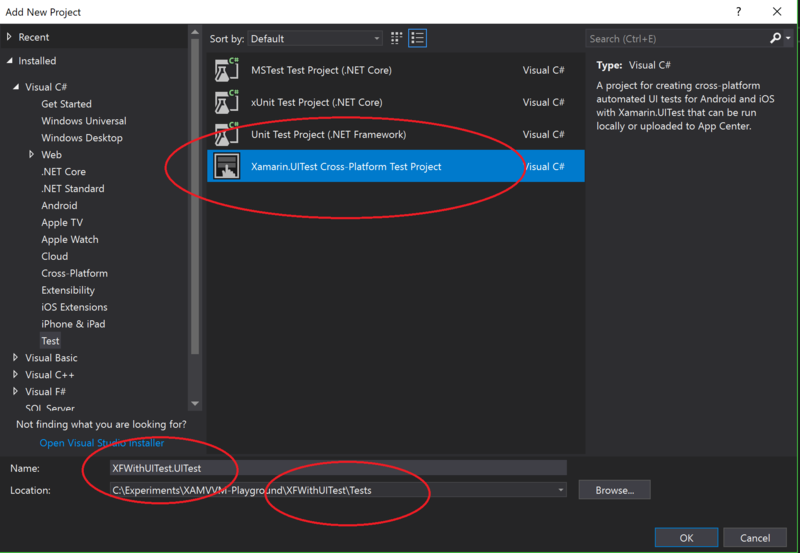 You could include all your Test cases in the AppTest class itself, or you can break them into separate classes regarding the Page, or the functionality type. So for this demo I’m keeping all my UITest cases in the AppTest class itself. Well now that we have structured the architecture, here’s the time for actual firing things up and you’ve got couple of things to remember! You can run your Android Tests on Simulator and Device directly without any modification as long as you provide the right APK path or the App Id. You can run your iOS Tests only on Visual Studio for Mac, and for the device you need to pass the provisioning details, and as of simulator, you need to pass the Simulator Id. If you’re using InstalledApp() or ConnectToApp() in your AppInitializer, then make sure the app is already deployed or running in the devices or simulator. Also make sure to keep your Devices or Simulators or Emulators screens switched on at all times, otherwise tests will break giving a waiting exception. Little cherry on top Architecture! Like I said before there’s many ways to construct the architecture for your Test project, one of my favourite ways is by separating the test cases by Page Scenario, which I think is a much cleaner structure. We’re going to create a base class, “TestBase” which has the constructor initiation and BeforeEachTest setup, then create a sub classes that inherits from it representing whatever the pages we have in the App. It should look something like this! And don’t forget you need to add TestFixture attribute for every single sub-class! Then it should give you a clean Test output as below. There you go, all the Tests are now nicely aligned and structured under the given Page which it associates with! As you can see its not that hard to set up your Xamarin.Forms project with UITest once you get the basic understanding of the moving parts and keep a clear structure in your head. 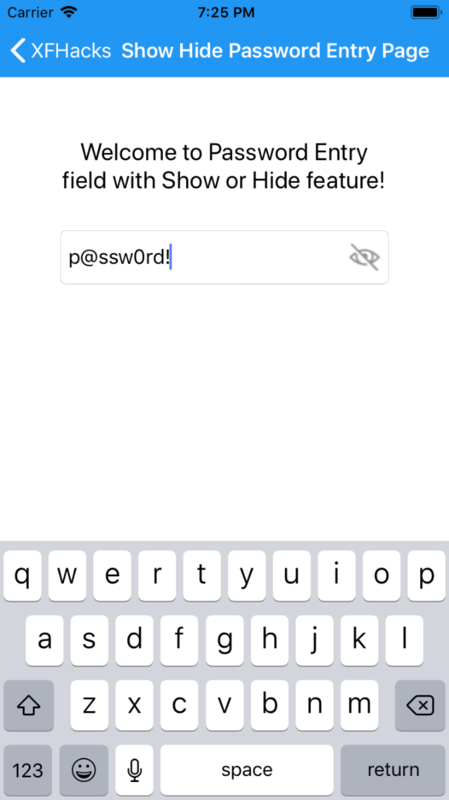 Let’s try new iOS 12 Security Code AutoFill feature in Xamarin.Forms! The new iOS 12 update has brought a whole bunch of awesome updates, although which were mostly already was available on Android years back. One of those features is getting rid of the old annoying OTP code filling process in iOS apps, where as every time you have to insert an OTP code into the app you have to quit the app and go to the messages and copy and past the OTP manually into the app. 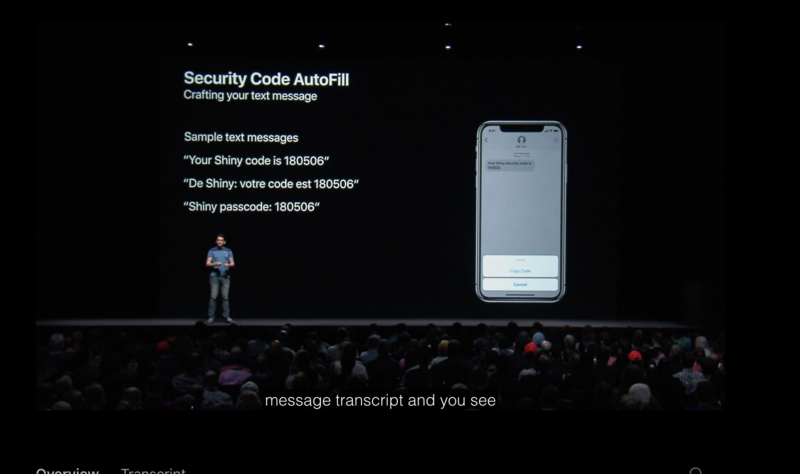 But with iOS 12 update they have made it easier by allowing Apps to auto read OTP messages without going back and forth into the Message app or copy and pasting. iOS now automatically suggest the top most available OTP message in the inbox for your OTP Text fields in the Keyboard suggestion bar. What happens is that when an OTP message receives into the Message Inbox, iOS runs a simple text matching algorithm that determines if that message is a valid OTP message or not and based on that keep a track of it in the memory, then when the user clicks on the OTP AutoFill enabled text field in an app, iOS keyboard popup that OTP as a suggestion in the keyboard. So that your users can fill up the OTP into the app without leaving the app or going back into the Messaging app. Pretty convenient! iOS 12 update in Xamarin! Following the new iOS 12 update, Xamarin has immediately released the support for it within weeks, so make sure to update your XCode and Xamarin nuget packs, to get your hands dirty with it! Let’s try it in Xamarin.Forms! Since iOS 12 is now fully supported on Xamarin, we can access those features in our Xamarin.Forms projects as well, by accessing the Xamarin native project levels. So before we get started please make sure you have updated your Xamarin iOS packages. iOS provides a new property called UITextContentType.OneTimeCode for the TextContentType property of UITextField in Xamarin. We’re gonna do this using a custom renderer allowing us to access the UITextField’s native properties, which is the native counterpart of Xamarin.Forms.Entry in iOS. Then’ let’s createthe Custom Renderer! There we go, setting up our Xamarin.Forms.Entry’s native counterpart UITextField for the OTP Auto-Fill feature in iOS 12. Alright that’s it you’re all good to go. How simple eh! 😀 yep even I was surprised at first. iOS still doesn’t give out much awesome features or god-mode control of the device, but still this by far a really nice and easy to use feature from a developer’s perspective! Few things to keep in mind! First thing, iOS 12 – OTP Auto-Fill feature works perfectly in Xamarin Native and Xamarin.Forms because of the native magic of Xamarin. You have nothing to worry! Can’t get your Xamarin UITest to work? then this might actually help! 😉 yeah no thank you Xamarin Documentation! So there I was having my Visual Studio updated to the latest version 15.8.8 and I created a fresh Xamarin.Forms project using the default template. Then I happily added the Xamarin.UITest project as well me being a TDD enthusiast. So I wrote some code in my Xamarin.Forms project, added some pages, some simple navigation and functionality. Then I tried to run my Xamarin UITest, and surprise! I couldn’t get it to work at all. Everything was building nice and well, but when I tried to run the UITest, Visual Studio was annoying me with the following error in Output log. You probably have multiple installations of the Android SDK and should update them or ensure that your IDE, simulator and shell all use the same instance. The ANDROID_HOME environment variable can effect this. So I tried Debugging the UITest, and no surprise the runtime error was popping up same as above. 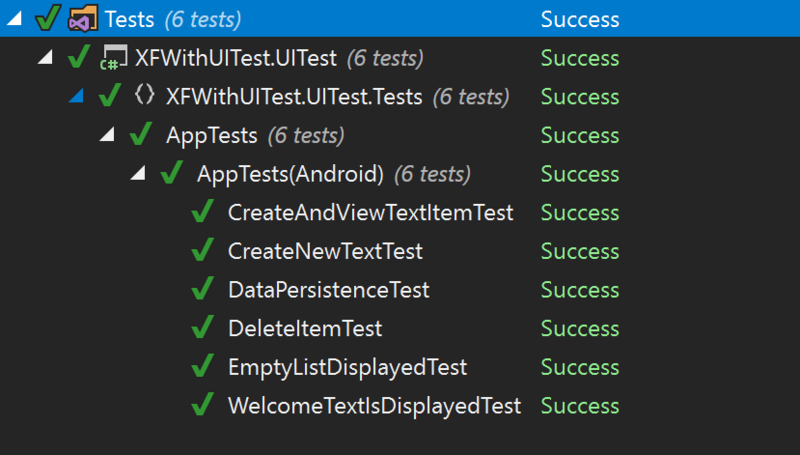 In utter surprise I went ahead to the Xamarin UITest documentation to see if there’s anything new that I haven’t heard before which needs to be done to get this super simple test project to run. But nope! I had done everything as it was mentioned in the documentation with the perfect configuration in my up-to date Visual Studio and project set up already. So what could have simply gone wrong? After many days of researching, testing and pulling out my hair, I figured out the problem. Xamarin.UITest version 2.2.6 (the latest to date: 26/10/2018)) does not support the latest version Android SDK Platform-Tools! Yeah, no thank you to the Xamarin Documentation that never mentions there’s a constraint on the Xamarin.UITest supported Android SDK Platform-Tools! I was actually surprised that there was no mentioning of this anywhere in the Xamarin UITest documentation! Sincerely hope they add some documentation between the support versions of Xamarin.UITest and Android SDK Platform-Tools. So I went ahead and downgraded my Android SDK Platform-Tools to version 25.0.3in my PC. Not only that, if you had followed the Xamarin UITest documentation and created your Xamarin.UITest project, then you may be facing the bellow error in your Error List window in Visual Studio! This is occurring when you add the Android project reference to your Xamarin.UITest project. This actually doesn’t cause any issues on the compilation or runtime, the errors just remain there without going away. I did a bit of digging on this issue and found out that this is a bug in Visual Studio, which has apparently been fixed in one of the previous versions in VS as Microsoft claims but its still occurring in my dev environment which has the latest version of VS 15.8.8! Since it doesn’t actually interfere in compilation or runtime, it shouldn’t really matter, but it would prevent you from adding Nuget packages to your Xamain.UITest project. Simple forget what the documentation says and remove the Android project reference from your Xamain.UITest project. Still having issues? Then these.. So if you’re still facing any issues pay attention to the following facts and give it a go! 1. 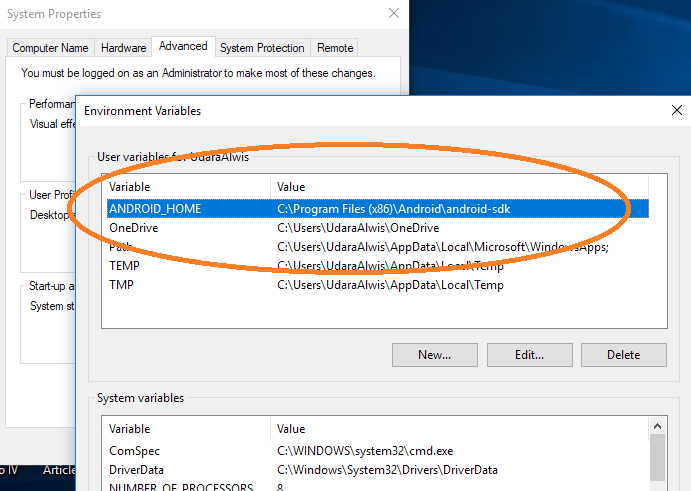 Configure ANDROID_HOME environment variable in your Windows system. Make sure you have added the User variable for ANDROID_HOME path in your Environment Variables. Make sure you have the exact version as shown above which is the NUnit version supported by Xamarin.UITest as of today. And you’re gonna need NUnitTestAdapter verion 2.1.1 for the tests to work on Windows. 3. 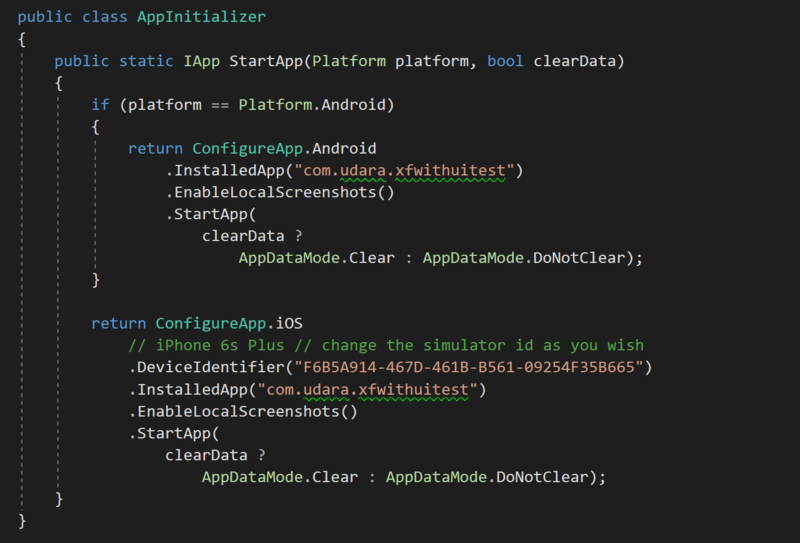 Make sure your AppInitializer is properly configured with apk path, or apk name. There are several ways to configure your APK or IPA file, either with the name or the full file path. Make sure you have chosen best way possible for you. Above is how I have configured mine, which depends on the already installed APK or the IPA file in the device. This is essential if you’re trying to get it to run on iOS, just in case if you had missed this, this is also mentioned in the documentation. 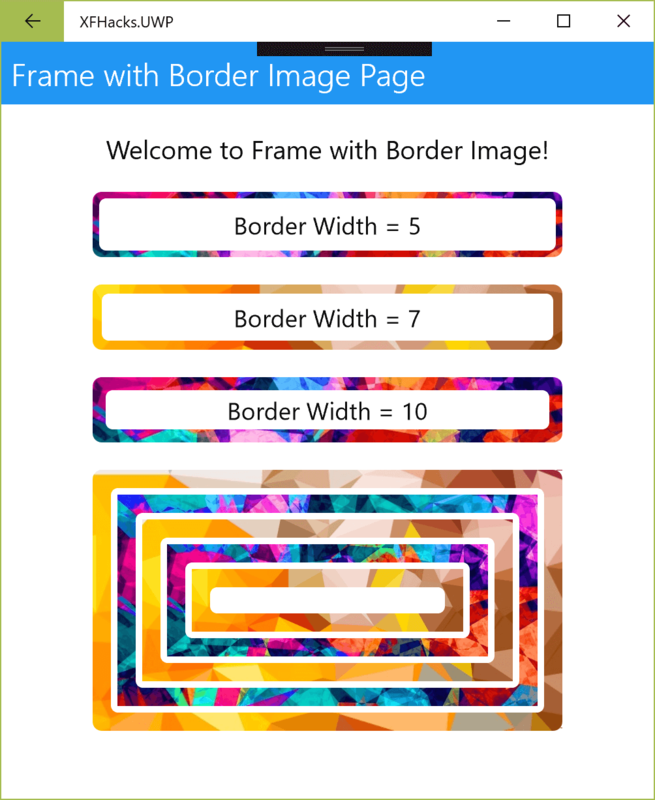 Ever wanted to have a Xamarin.Forms.Frame with a Border Image? 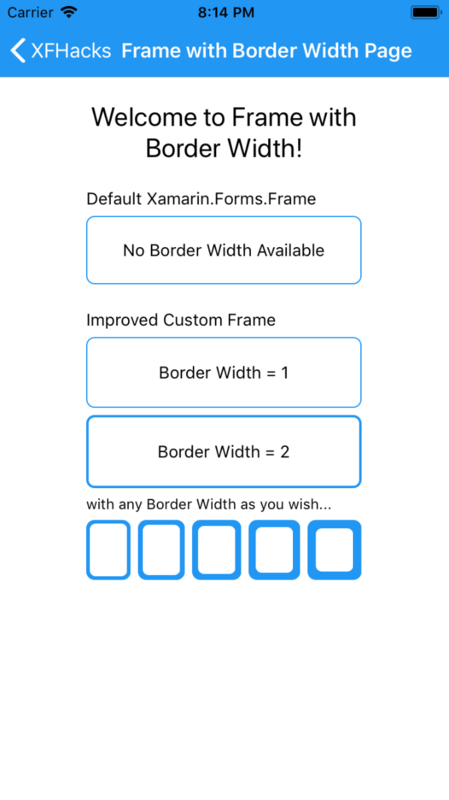 Or have a Border Image around any of your Xamarin.Forms Elements? Welcome to another lightening short post of me hacking around Xamarin.Forms elements! 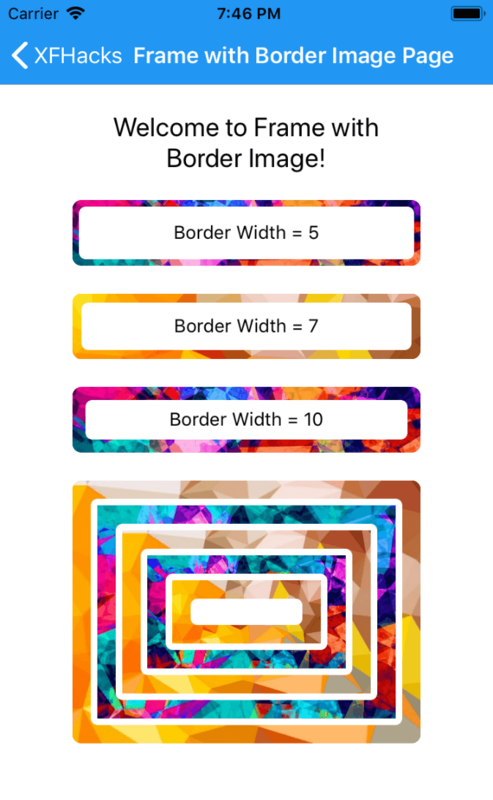 The Xamarin.Forms.Frame by default only has a boring BorderColor property without even letting you to set the Width of the Border or even set an Image as the Border. So I thought of making use of my own crazy imagination and hack my way around to get this to work right from Xamarin.Forms itself! Buckle up fellas, its recipe time! 😉 I’ve been writing quite a few hacks around Xamarin.Forms Frame element, and this recipe is also going to be based on my previous posts, XFHACKS-007 Frame with a Border Width! I would rather recommend you read up on that before continuing here, regardless I would explain the same concept in short here as well. Basically we’re placing a Frame element (child) inside another Frame element (parent) with a Margin value which will create visually a single frame with a Border as our choice of the Margin. Now keeping that in mind for our Border Image we’re simply going to add Grid into the parent Frame and place an Image in it, while using the IsClippedToBounds=”True” property in both parent Frame and Grid Layout to avoid the Image element rendering itself outside the bounds of the parent Frame. Then on top of that Image inside the same Grid we’re placing our child Frame that I mentioned before with the Margin property that renders the Border aspect of the whole view. Behold the golden XAML code! There you have the Frame with Border Image in XAML just like I explained earlier. We have the parent Frame with IsClippedToBounds and CornerRadius property, the Grid and the Image with form the Border Image. Notice the Padding=”0″, since we want the Image with the Grid to spread across the parent Frame. You could change the CornerRadius as you wish to control the curved corner of the Frame. Let me showcase the awesomeness of this with something fun! There you go! 😀 Running side by side Android, iOS and UWP. Well then, that’s it for now. More awesome stuff on the way! Cheers! 😀 share the love! 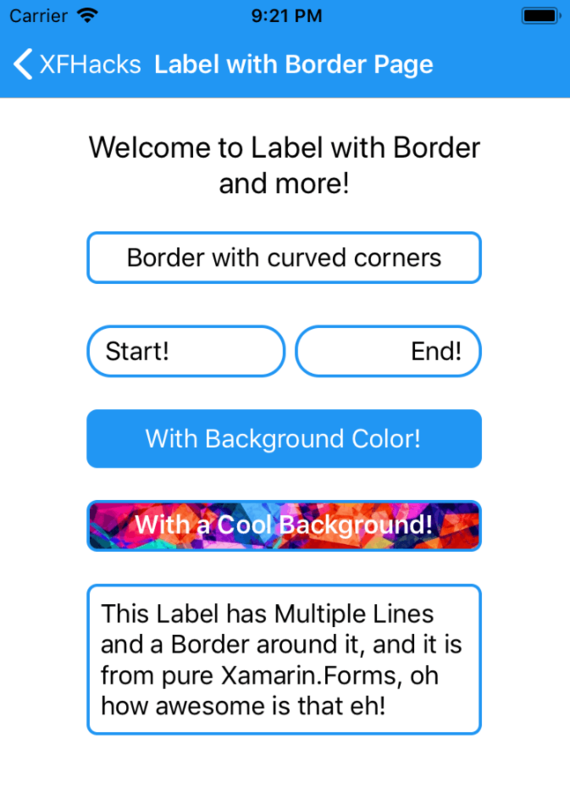 Ever wanted to have a Xamarin.Forms.Label, with a Border, or even better with a Background, or with a Corner Radius customization? Welcome to another lightening short post of me hacking around Xamarin.Forms elements! 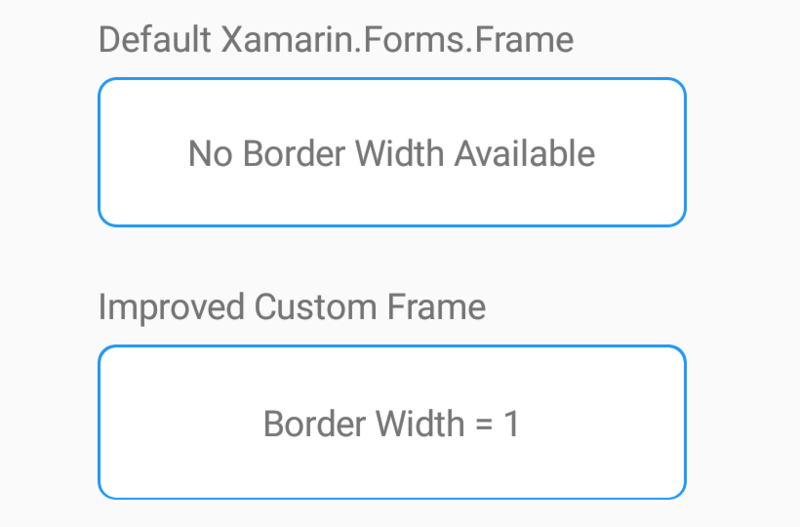 By default Xamarin.Forms.Label doesn’t have a Border, Background neither a Corner Radius property, the only possible way to achieve that is by resorting to custom renderers. So I thought of making use of my own crazy imagination and hack my way around to get this to work right from Xamarin.Forms itself! That’s what we gonna be build yol! Buckle up fellas, its recipe time! 😉 Now this hack basically has mostly to do with my previous post, XFHACKS-007 Frame with a Border Width! If you would like to read more on detail about it then please check that article and come back here, but let me explain it in short form here though. Basically we’re placing a Frame element inside another Frame element with a Margin value which will create visually a single frame with a Border as our choice of the Margin. Now for our Label, we’re going to place it inside that custom Frame we just built, giving it a nicely rendered border around it. 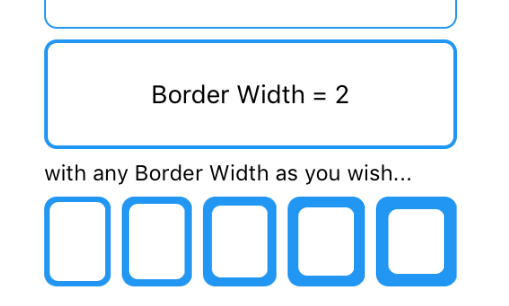 You have the complete control over the Border Width property as explained in my previous article. If you want to have curved sides for the Label Border, then simply increase the CornerRadius=”16″ parent Frame and CornerRadius=”14″ for the child Frame. How about that Background I promised earlier, well then simply set the child Frame’s background Color as you wish, and if you prefer to have a different Color for Border and Background, just make sure to set different colors to parent Frame’s Background color and child Frame’s background color. Now how about having a Background Image, what you need to do is simply add an Image behind the Label using a Grid Layout by laying down both the elements on top of each other. There you have it, the golden XAML! So what we have done here is basically the same concept but with a bit more icing on top, by removing the padding inside the child Frame allowing the Image background to stretch to on to the edge of the border. Then inside the child Frame we have a Grid Layout, and its got a HeightRequest property which determines the Height of the Label, meanwhile cropping out using IsClippedToBounds property, the excessive rendering of the Image inside that’s acting as the Background. Load your cannons, fire it up! 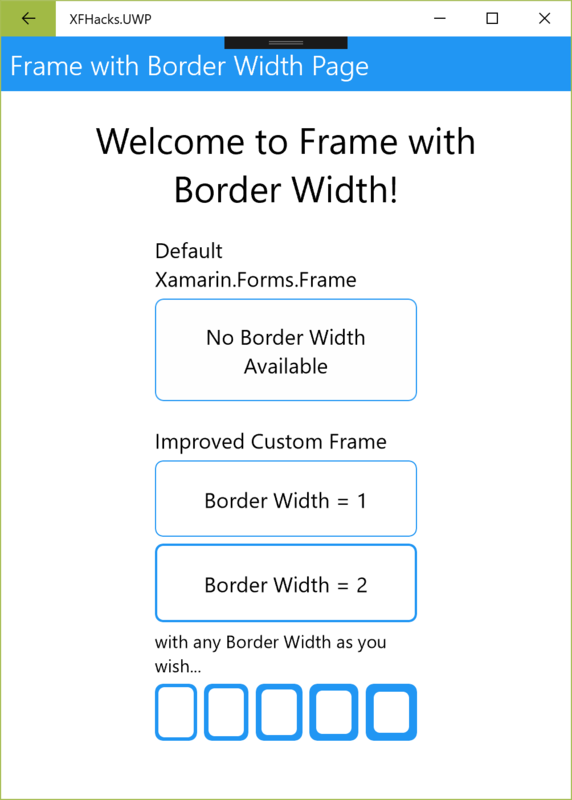 Ever wanted to have a Xamarin.Forms.Frame with a Border which you can customize the Border-Width property? Welcome to another lightening short post of me hacking around Xamarin.Forms elements! The Xamarin.Forms.Frame control is such a nice and useful UI element. One of the nicest features of it is the Border property, that draws a border around the View. 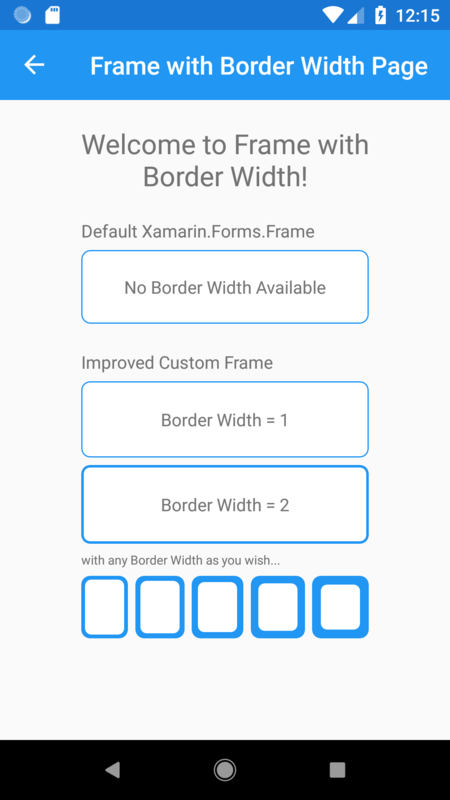 But by default Xamarin.Forms doesn’t allow you to customize it, except for the BorderColor property, it is missing a very much needed property that even I personally wish if it had, that is the “Border Width” property, so that we can renderer a nice Border around the Frame as whatever the thickness we wish. That’s what we gonna be build yol! A Frame control with a Border Width property! Buckle up fellas, its recipe time! 😉 So the idea here is to simply, build a custom control by adding a Frame Element inside of another Frame Element, like a View parent-child relationship, and giving some Margin property values to the child Frame, which creates a border-like visual around the child Frame, by the parent Frame. 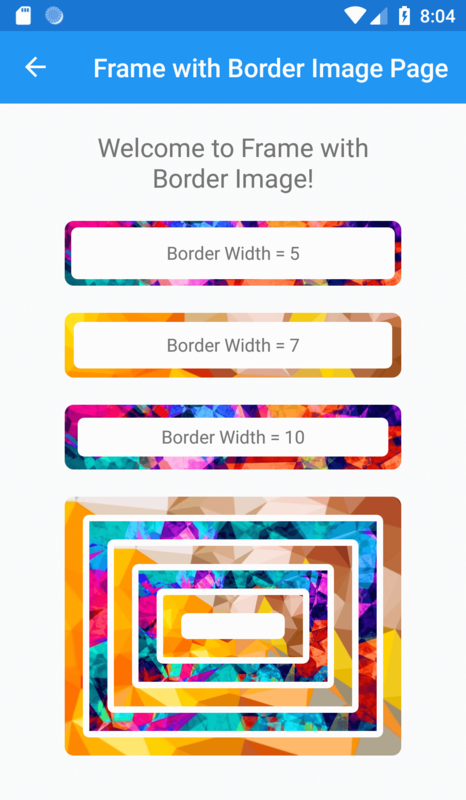 Here we can set the background color of the parent Frame as we wish, which will be rendered as the Border around the Frame, and the Margin property of the child Frame will determine the Width of the visible Border. So obviously since we need to push the child’s Frame throughout the panel of parent’s we’re setting the parent Frame’s Padding to zero. Then whatever the CornerRadius we want to set for our custom Frame will always be in a manner that the child Frame’s CornerRadius will be two points less than the parent Frame’s CornerRadius, this is to maintain the nice curved corner radius of the whole custom Frame once the border is rendered. Also if you need to maintain the HasShadow feature for our custom Frame then you should only set it for the parent Frame, not the child Frame, and since we’re using our own custom built Border we are not going to be using the default BorderColor property of any of the Frames. There we go, just like I explained the parent and child Frame positioned accordingly with the appropriate properties. Notice how I have set the Margin=”1″, which determines the Border Thickness or the Border Width, like I explained before. There you go, completely identical to the default Frame but packed with awesomeness! Alright load your canons, fire it up! Advanced Segmented Button Control in pure Xamarin.Forms! Welcome to the Part 2 of my Segmented Button Control in Xamarin.Forms, in which this time we’re going to take it to the advanced level and make it even cooler and more awesome! 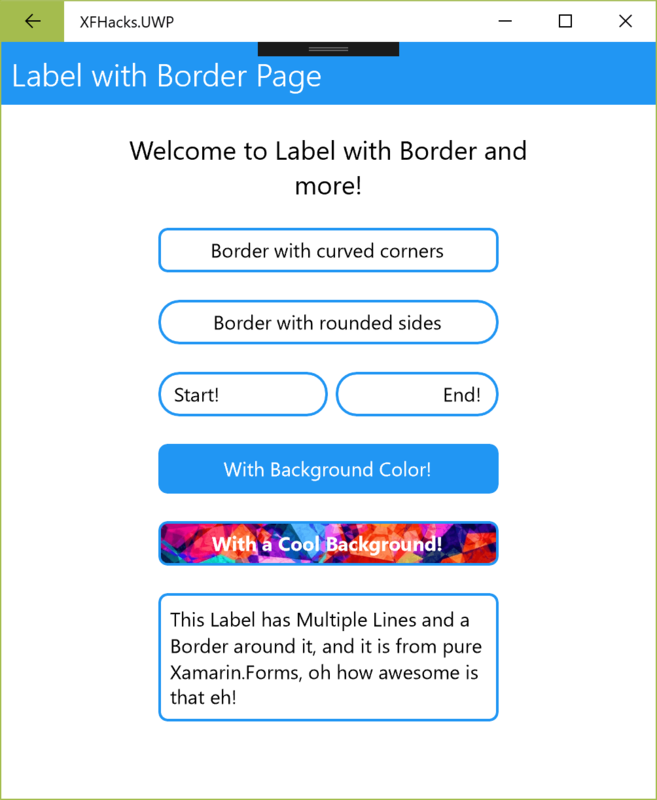 If you missed the Part 1 of this article, please go on there and give it a read,A Segmented Button Control in pure Xamarin.Forms! Specially since this article is going to be heavily linked to it. So there we looked into how to create a simple yet awesome Segmeneted Control in pure Xamarin.Forms without any custom renderers or native code. And in this article we’ll be looking into how to make it even more awesome with a bit more advanced implementation. Keep in mind I’m not going to explain all the concept bits which I had discussed in the Part 1 but I will be mentioning about them to be referred to. So let’s begin! A Segmented Control, or as some call it Grouped Button Control, or Tabbed Button Control or some even call the Rocker Control, is what I’m gonna share with yol today, built 100% from Xamarin.Forms! Specially in this Part 2 article, we’re including the ability to add Segmented Buttons on the go and change the Color themes at run time, making it full dynamic. We’re going to rely on the same basic concept’s we talked about in Part 1 article, only the implementation and handling of the behavior to include the new features are going to be different in this. So this is basically going to be the same concepts we’ve used in the Part 1 therefore I’m not going to be repeating the same stuff I had explained in details in Part 1 Article. Please give a read to the “Recipe time…” section in it. In here we’re going to separate the Tab Button element from the SegmentedControl, so that we can dynamically add the Tab Buttons dynamically at run time. We’re going to maintain an IEnumerable list in the SegmentedControl. Also unlike last time we’re going to implement and properly handle the Color properties and SelectedTab index property, so that all those properties cab be changed dynamically as we wish. Well that’s pretty much it, with a bit more details to be gotten into later. So let’s begin with our separated TabButton element, which you could also identify as a “Segmented Button” element of our Segmented Button Control. This element includes with a simple Button, Label and BoxView inside of a Grid view, that makes it up just like the last article implementation. There’s the XAML with the basic Button and Label which handles the Text and click event of the TabButton and then the two BoxViews that we’re going to use to decorate for Android and iOS platform specific look and feel. Next let’s take a look at the code behind awesomeness of our TabButton control. So in the code behind we’re handling all the functionality and look and feel appearance of the Tab Button segment or element. In the constructor itself we’re passing in the Color properties, Text, Index of the current Tab Button and the selected Status of this Tab Button, then we’re assigning them to the visual elements of the TabButton appropriately, whilst, storing the important values locally for later use. The SetUpColorScheme() applies to color properties of the element, and I’ve moved that to a separate methods because we’re going to be allowing the user to update the color properties on the go. If you had noticed how we’re subscribing to the TabButton_OnClicked in our XAML code, there we’re handling it by calling the SetSelectedTabState() method and SendTabButtonClicked(), which will update the appearance of the current TabButton to the Selected State and then invoke the EventHandler for whichever the entity that’s subscribed to it from the outside. Then the an important Public method, UpdateTabButtonState() which allows an external source to update the current Visual-Selected State of the TabButton. You can see how it calls upon the SetSelectedTabState() and SetUnselectedTabState() based on the passed in parameter selectedTabIndex. Last but not least the UpdateTabButtonColors() allows us to update the Color theme of the TabButton on the go from an external source. That’s pretty much it, I’m sure you’re already familiar with the styling of the Frame element from my previous post and the Grid named as TabButtonHolder is what we’re going to be using in the code behind to maintain the Child elements of TabButtons. So its all similar to the previous article’s implementation, all the properties and handling of the behavior, except now we’re maintaining a list of TabButton references in TabButtonsSource property, which is a list of strings that we could use as names for the Tabs, instead of having a hard coded static Tab buttons in our previous implementation. And we’re subscribing to it to handle the adding and removal of the Tabs or Segmented Buttons at run time on demand. Inside the loop we’re creating new instances of TabButton and passing in the relevant properties that are assigned, then subscribing to the TabButtonClicked event, ending each loop cycle by adding the TabButton instance to the TabButtonHolder Grid. Now that we are done with our awesome AdvSegmentedControl, next let’s consume it in anywhere we wish in our Xamarin.Forms app! Cheers! 😀 Keep on going my fellow devs! XFHACKS-006 Password Entry with show/hide Text feature! 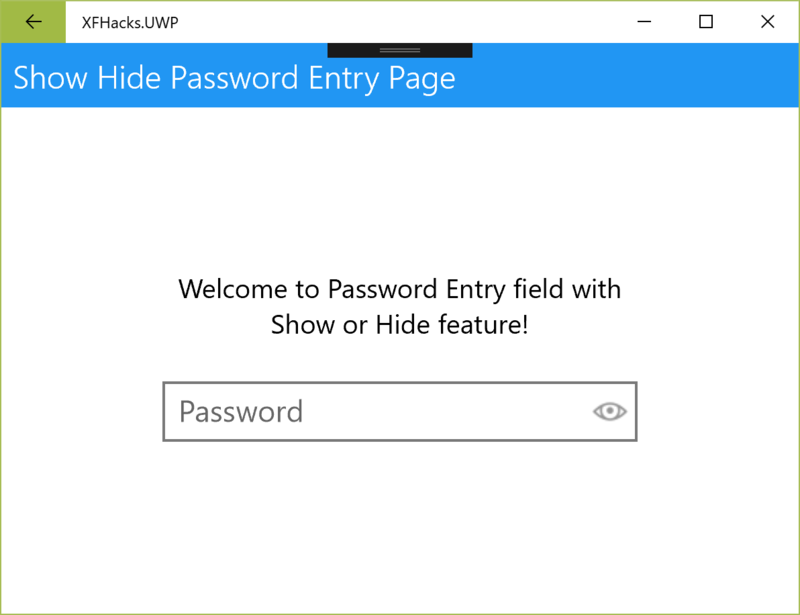 Ever wished if your Xamarin.Forms Password Entry control had the option to reveal, or show the Password text that the User types on demand, instead of the black dots? 😉 Even better, without any Custom Renderers or Platform Specific code? Welcome to another lightening short post of me hacking around Xamarin.Forms elements! So in Xamarin.Forms to enable this feature usually you need to resort to creating Custom Renderers or some platform specific implementation, which is a tedious process and a complicated implementation. So I thought of making use of my own crazy imagination and hack my way around to get this to work right from Xamarin.Forms itself! Since we’re maintaining two Entry elements, we need to make sure both of them have the same Text value at any point of the user’s interaction. So to make this happen we’re going use Element to Element binding in Xamarin.Forms, where as we are binding the Text field properties of both Entry controls to eachother. Thereby one Entry’s Text changes immediately reflects on the other one and so on. Here we go, explanation time! So the two Entry elements are laying on top of each other and bound to each other’s Text properties, while having one Entry as IsPassword=true and the other opposite. I have given names for the Elements because we need references of them to handle the behaviour inside our TriggerAction which I will show next. Then the Button with the Icon Image Element is aligned to the very right corner of Parent layout, laying on top of both Entry elements. I have added some padding to it to avoid it conflicting with the border of the Entry in iOS and UWP, then for Android it shouldn’t really matter visually. There’s a HeightRequest=”27″ and WidthRequest=”35″ given to this Element group because I needed to have some horizontal space besides the Image icon visually. For the Image we’re using a EmbeddedResource type image, which makes things really easy for managing the Images. Then for the Parent Grid Layout that holds all of these Elements together,is using IsClippedToBounds property to make sure everything holds inside the Bounds of the Grid as a single UI Element. Next let’s look into the golden TriggerAction! Here’s the most important bit where we’re handling the behaviour logic of our awesome Password Entry Control! At the moment of Invoking the Button click we’re doing a simple FindByName<T> look up for our required Elements, that are the EntryPassword field, EntryText field, and the IconImage. 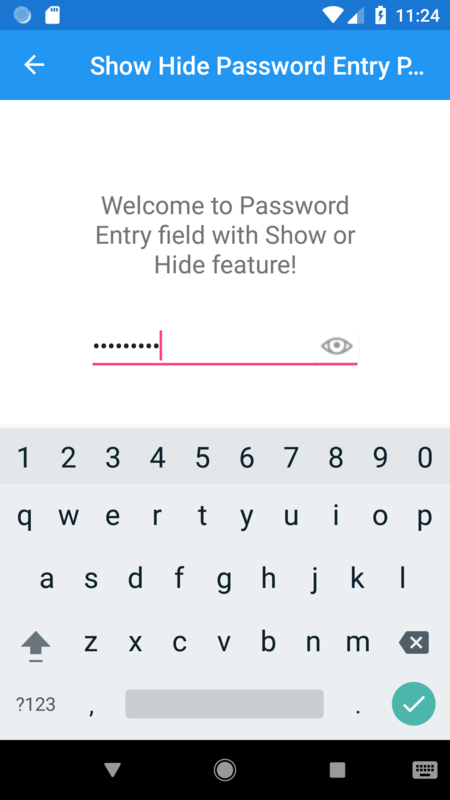 First of all we’re setting the visibility of the two Entry Elements opposite for each other, as in if the User clicks on Show Password state, then the Entry with Text property will be displayed, and the user clicks on Hide Password state then the Entry with Password property (black dots) will be displayed. Then based on the state, we’re updating the button icon’s Image source, as you can see we’re setting the showpasswordicon.png and hidepasswordicon.png respectively depending on the current state. Finally we’re doing something extra to make sure whatever the visible the Entry element is still on Focus after the switching of the Password visibility state. There we go, pretty straight forward yeah! Alright let’s see this in action! XFHACKS-005 Button with full control on Text and Icon! Ever came across an instance where you wished if you had more control or customization over the Text and Icon properties of your Xamarin.Forms Button? even better even without any Custom Renderers or Platform Specific code? Welcome to another lightening short post of me hacking around Xamarin.Forms elements! Talking of the Icon Source, you can only use Platform Specific Local Images for it, you cannot use Embedded Resources for it. So I thought of making use of my own crazy imagination and hack my way around to fix all those limitations! Now as an out of the box solution for this we could avoid using Xamarin.Forms Button totally and switch to a Xamarin.Forms Label or Image control with a Tap gesture recognizer attached to it. But then it wouldn’t actually give that nice look and feel of a button does it, specially in Android that nice ripple effects and on iOS the fade out effect on the button click is something really nice to have on your UI. Here’s my awesome solution, we’re still going to stick to Xamarin.Forms Button button, and we’ll be laying down a Label or an Image on top of our Button view inside a Grid layout. This is actually very common hack of mine if you had gone through previous XFHACKS articles of my blog. Yep sounds super simple, yet solves all of the issues I just mentioned above. 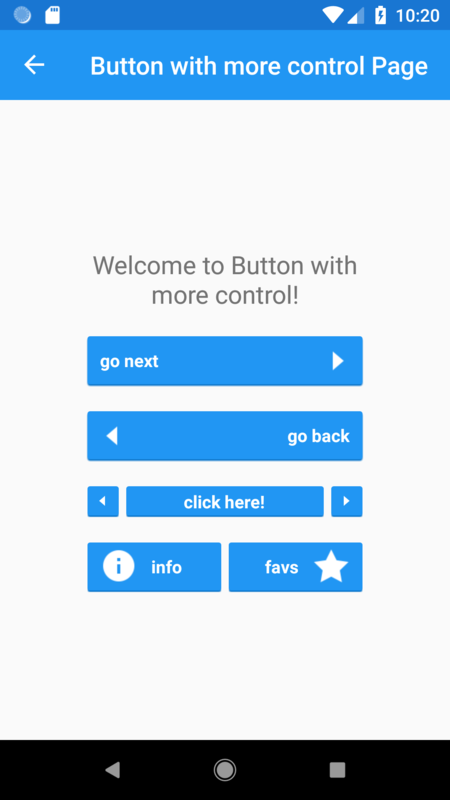 Basically we’re constructing our own Custom Button control right from Xamarin.Forms elements, properties and behaviours without any custom renderers or platform code. So getting into more details, here’s how we’re going to solve the above talked issues. For Alignment of the Text and Icon in the button, we are going to use the HorizontalOption of both Image and Label element that we’re placing on top of the Button. Then the Position of those elements, we shall resort to the Margin property of each. Since we’re using the Image control itself the Source property issue is automatically solved. Then as an added advantage you could also have the control over the Aspect property of the Image Icon you want to display in your button. Now on top of all that one might wonder when you place a Label or Image on top of a Button, wouldn’t it obstruct the Clickable touch area of the Button? That’s where InputTransparent comes into rescue, passing down the touch even down to the Button straight away! To add some cherry on top of the icing, we’re going to use the IsClippedToBounds property to crop out any areas of the inner elements of the Grid being rendered outside the View bounds of the Grid itself, so everything comes together as a single Element on UI. There you have it as we discussed earlier, our empty Button and on top of that the Label and the Image elements inside a Grid. As you can see the Button has some Margin value added for Android run time of, “-4,-6,-4,-5” which is to get rid of the default empty space that’s rendered around the Button at Android run time. The button will be spread across the whole Grid in background with its default HorizontalOptions=”Fill” property. The Grid’s IsClippedToBounds=”True” property value makes sure it will cut off any inner elements that will render themselves out of the bounds of Grid. You can set whatever the HeightRequest or WidthRequest as you wish if you want to customize this even further. Now speaking of the Label and Image you can see how I’m using the advantage of HorizontalOptions to align the elements as whatever the way I wish along with the Margin property of them, adding space wherever I wish. In here we have pushed the Label to the beginning of the Button and the Icon to the End of the Button horizontally. Next the InputTransparent=”True” comes in solving the touch issue, which will pass the touch action down to the Button element when the user clicks on it, giving the exact effect of a Button. The use of Image element we can now set whatever the size we wish for our Icon inside the button and adjust its Aspect property and so on. And let’s try something else as well! Lets have a Button which has its Text and Icons aligned to the Right most corner. Here’s another example where I have pushed the Image Icon to the End of the Button and the Label to be following it horizontally. You can follow the same implementation and have our Button’s Text and Icon aligned t other Left most corner. Now just like that you can customize all the aspects of a Button using this hack I just shared, just set up the Label and Icon with whatever the properties and customization as you wish on top of a Button. That’s it! Let me share some examples I’ve built using this awesomeness! 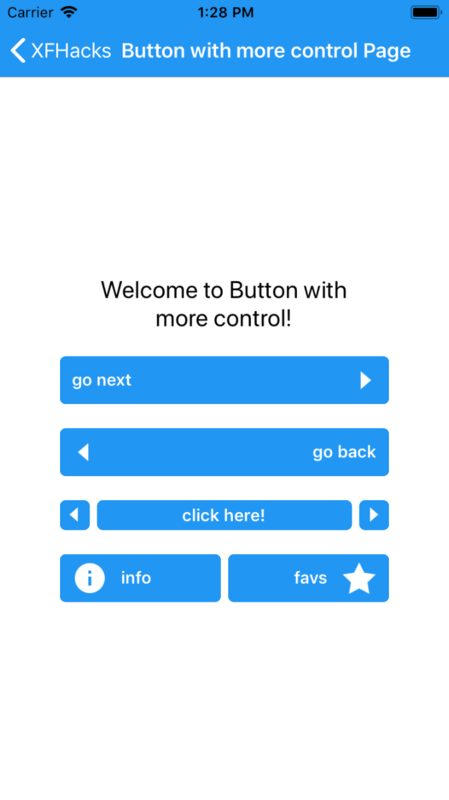 Simple Segmented Button Control in pure Xamarin.Forms! A Segmented Control, or as some call it Grouped Button Control, or Tabbed Button Control or some even call the Rocker Control, is what I’m gonna share with yol today, built 100% from Xamarin.Forms! So there’s many different interpretations of this UI elements and also different use cases. Specifically you can see this in native Tabbed Page views in both Android and iOS. And in native platforms they actually have their own Segmented button controls, that allows you to have a set of buttons in a single segment, that allows you to have a selected state, which will let you perform a certain operation, change a value or load a certain View to another element. So when it comes to Xamarin.Forms, there’s no out of the box UI element that provides this view, unless you use Xamarin.Forms TappedPage control, in which case is impractical if you’re not in need of a Tabbed Page, or worse case in a Content element area where you absolutely can’t use a Page element. Here’s a sneak peak of what I built, on iOS.. So first thing, we need to keep in mind the aspect of having the same look and feel of a native Segmented control, in aspect of both Android and iOS, therefore we’re going to be using a lot of platform specific properties in XAML and code behind. We are going to have two Buttons inside a Layout, to emulate the two segmented Buttons. The layout is going to be a Xamarin.Forms Frame, since it has the property CornerRadius, which is vital to gain the curved corners appearance for iOS, and Border property, which we can use to draw the border around the element for iOS. As of Android we can disregard both of those properties. Also don’t forget about the IsClippedToBounds property which all the Layout elements has in Xamarin.Forms, allowing you to crop out of bounds elements inside the layout, which will allow us to have that curved corners in iOS without the button borders popping out of it. Now speaking of the Buttons, we can’t use Buttons with text inside, since the default behaviour of a button restricts the visibility of Text inside it. Therefore we’re going to use a little hack I have always used, that is placing one element over another inside a Grid view. So we are going to use a Button without text inside of it, and then a Label on top of it that represents the Text of the Segmented Button. So you’re probably worries about the Button click behaviour since we’re laying out a Label on top of it, but hello don’t worry, that’s where InputTransparent comes into rescue, passing down the touch even down to the Button straight away! So on selection of the Button we shall do the necessary changes to show the IsSelected status. Also not to mention that we’re going to maintain properties inside the custom control, like Colors, Text, Selected Button Index properties and also an EventHandler to inform the changes of the Segment button selection. We’re going to create a custom control elements that’s going to be independent and reusable anywhere in the project. Let’s call it SimSegmentedControl, thus denoting “Simple Segmented Control”! Now let’s get into the inside elements of our SimSegmentedControl, which is basically the Frame Layout that I explained before. As you can see I have added a whole bunch of platform specific customization values for Android and iOS to achieve the design we’re targeting for, such as CornerRadius and Height. Then let’s add our Segmented Button elements, just to make it easier let’s identify each of them as “Tab Button” element. Voila! behold the two button elements, with all the platform specific customizations, just like how I explained before, Label on top of a Button inside a Grid layout. Also you may have noticed the Margin property that I have used with “-2,-3,-2,0”, which is to stretch out the empty border line of the buttons out of the Grid so it crops out with the IsClippedToBounds property. And the BoxView is to emulate the bottom line we have in Android look and feel of the Segmented Control. Now this is where we’re basically going to handle all the action in our SegmentedControl! So I’m not going to spoon feed the whole code in this blog post, since its going to be a pretty lengthy one, so I’ll be cutting out most of the repetitive code which you can easily figure out yourself or just check out on my github repo where I have committed this whole project code. So like I explained at beginning we’re going to have a bunch of properties that are going to handle all the customization values such as Color, Text, SelectedIndex, EventHandler and so on. And then apply a whole bunch of code behind customization for platform specific look and feels, along with the handling of Segment button click event behavior. So we PrimaryColor and SecondaryColor which handles the two main colors that is styling our SimSegmentedControl, which is exactly how it being used in native version of this control as well, just two simple Colors styling the whole element. Then Tab1Text and Tab2Text property to handle the Text that needs to be displayed in the Segmented buttons. As you can see OnParentSet (this is when the View is rendered in memory and just about to be displayed on the Page) we’re applying all the platform specific customization for the elements in our SimSegmentedControl. Then you can see we’re setting the Tab1 and Tab2 text properties to our Labels, which is not actually good practice, but I was too lazy to add that in the PropertyChangedEvent handler of those respective bindable properties. After that at the end you can see we’re setting the default values. Also the SelectedTabIndexChanged EventHandler is there to notify any outside element who wants to be aware of the selected Tab in our SimSegmentedControl, so they can perform whatever the action based on it. Then let me get into the SelectTab1(), SelectTab2() and SendSelectedTabIndexChangedEvent methods. 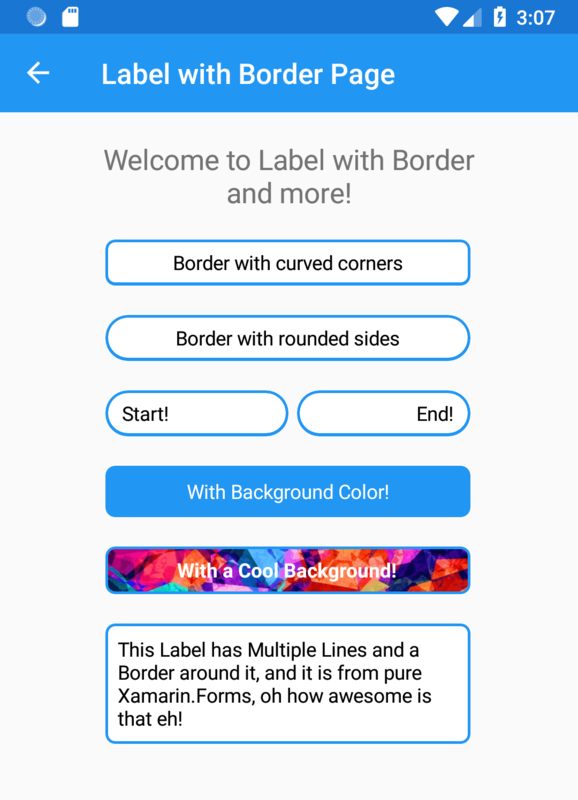 So there you can see in SelectTab1() we’re setting up the necessary customization for the Selected state of our Segmented Button for both Android and iOS, such as the BackgroundColor, TextColor and whatnot. And then in SelectTab2() we’re doing the exact opposite customization, Button 1 -> Unselected and Button 2 -> Selected appearance. Then in the SendSelectedTabIndexChangedEvent we’re basically broadcasting the selected Tab index of our SimSegmentedControl with the SelectedTabIndex property value. Easy peasy, you just set the property values such as PriaryColor, SecondaryColor and so on that we created in our SimSegmentedControl and do a bit of customization if you wish to 😉 like I’ve added some padding for iOS! In case if you’re wondering how to use the SelectedTabIndexChanged, you basically subscribe to that event and perform whatever the action you desire, whether it be changing some values, or swapping some Views or whatever your requirement is! Let’s change up a bit of the colors shall we! Well if you ask me this is not the exact implementation I used for my actual requirement, this is more of a very simple implementation of it. Check out the Part 2 of this article: Advanced Segmented Button Control in pure Xamarin.Forms!